I sometimes forget how long we've been on the search for the perfect parma - In my mind the last time we visited the Deluxe Rooftop was probably last year, but reading up in preperation for this article I realised it was actually in twenty-goddamn-twelve that we first visited. Good lord it gets away from you, doesn't it? Aesthetically not much has changed on the Deluxe rooftop in three years. Unfortunately Melbourne has decided to give us a rather mediocre spring this year so the rooftop shades were drawn to keep out the drizzle. Handy that they have them, but the big appeal of the Deluxe rooftop is basking in the glorious evening sun. 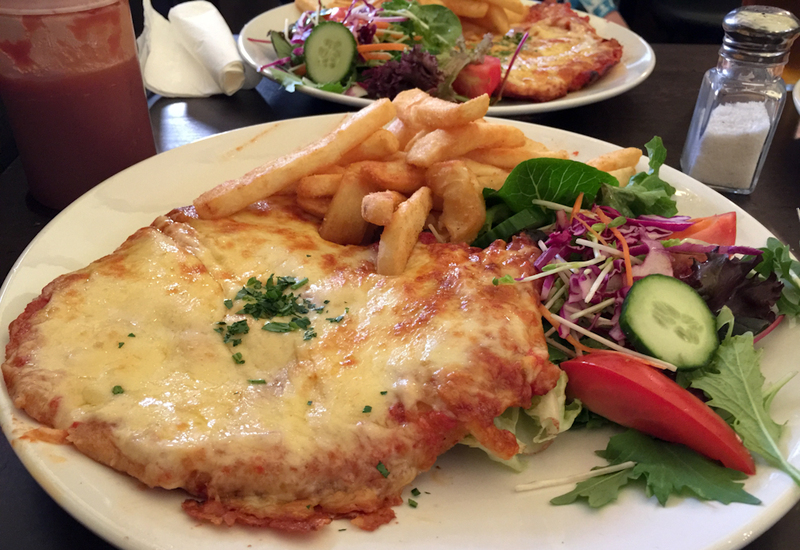 Last time we visited Deluxe their $10 parma special was on Thursday, which they have now switched to Friday. Same price, different day. We arrived at around 7 to find a lot of the tables already had been snatched up - Luckily we found a spot but if you intend on heading down I'd suggest either getting in early or booking a table in advance. Reviewer Nikki partook in the drink special, I've gotta say I've seen worse espresso martini's for a much bigger price tag - not too shabby at all. As for beers there isn't a huge range on tap. Little Creatures is pretty much as crafty as it gets on the rooftop, but if you're content with a pint of Carlton you shouldn't have any issues. About ten minutes after ordering our parmas arrived from the kitchen. As usual with re-visits first we'll show you what it did look like compared to what it is now. Quite the change! The schnitzel quality has increased significantly - although they pounded the schnitzel a bit too thin for my liking. I like my chicken thick and juicy, not smashed thin to look bigger on the plate. My second criticism (and I only have two) is that the crumbing was horribly soggy, as if the parma ducked in for a quick sauna on its way from the kitchen to the table. Other than that though, I was impressed. The toppings were plentiful, with a great coverage and good flavours all around. The slices of ham made their presence known and the cheese blend had a relatively strong yet not overpowering sharp punch that I enjoy on my parmas. The chips were by far the best thing on the plate. Great serving size, beer battered, well seasoned and cooked to perfection. Not much beyond the addition of some garlic aioli could have improved them - a fine accompaniment to the dish. The salad was a mixed bag. The ingredients were fresh, crisp and delicious with plenty of variety and looked great on the plate - however (and i'm not sure if this was an oversight in the kitchen or this is actually how its done at Deluxe) but the salad had zero dressing. And I'm a guy who likes his dressing. Like I said, the ingredients were crisp and fresh - But without dressing it was quite dry and a bit of a let down overall. For only a tenner it is extremely hard to complain about this bird. Our previous review was over twice the price as this one, and I enjoyed Deluxe's much more than I did that. If I was paying the full $19 for this one I'd probably be complaining a bit more - But $10 is less than you would pay for a pint of beer in a lot of places these days. I'd have no qualms dropping in again. The three of us that attended the review this week were like the Three Bears. Reviewer Fridge was not a fan, he could not get past the sogginess of the crumbs and thickness of the chicken. Reviewer Nikki was the other extreme, she cleaned her plate with gusto and, despite a couple of issues, wholly endorsed the Deluxe parma. I fell somewhere in the middle. I wasn't blown away, but I wasn't disappointed either. Whatever I say I don't think Deluxe will really care - The amount of parmas they were cranking out of the kitchen was a sight to behold, and I don't see it slowing down any time soon. Worth a crack if you're in the area on a Friday night, worst case scenario you're down only ten bucks and got some quality chips out of the deal. Schnitzel was a little thin for my liking.